I've finally got the aluminum head install completed! Looks and runs great. I haven't driven it very hard yet because I need to install a torque strap yet on the drivers side since there is only 1/2 inch clearance between the intake and the shock tower. I'm trying to install pics but something not working right. I created an album in the "image gallery" and posted 4 pics. Here is the link. Looks great! Very nice workmanship. 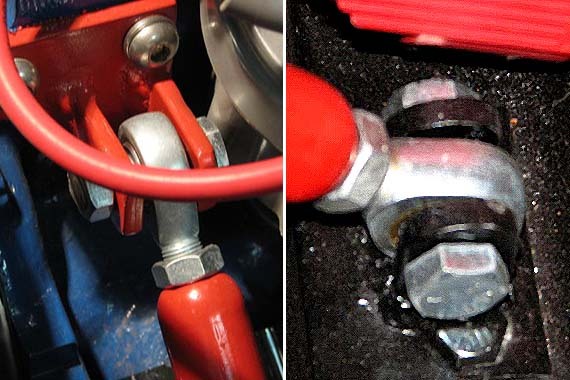 xctasy wrote: Torque straps, two factory kinds...the Hertz Renta Racer Chain...bottom left by the oil filter, a chain from the cross member or chasis rail to the engine "some how" Two bolts, one piece of chain partly torqued that the limits the engine under a burnout launch. A pice of steel then replaces it once you've gotten the design right. 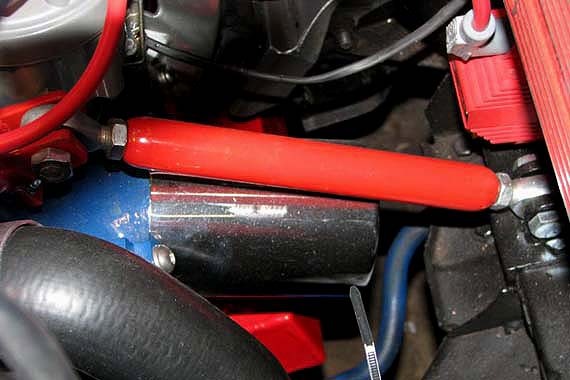 There is about 3 to 4 degrees of engine rotation under soft engine mount transmission, you set a buffer zone to half the amount to about 1.5 to 2 degrees. No pictures on the net of the 1971-1977 European Granada Mark I 3.0 V6 right hand side upper firewall dampener. Replicating the "I see says the blind man" item requires you to use you spring tower brace and hook it to the 2V inlet manifolds bolts on the last intake tract. 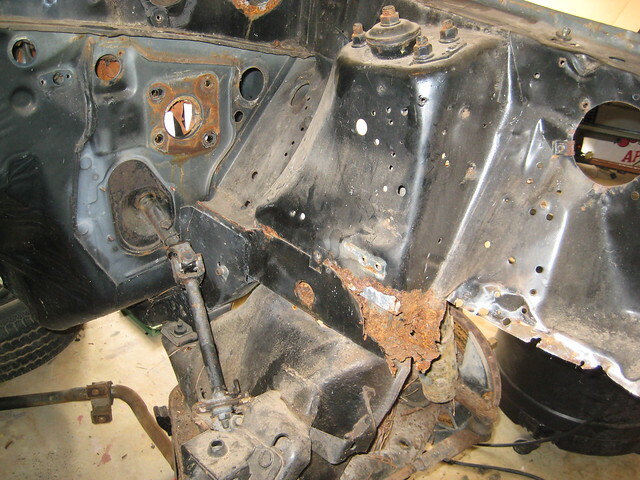 Make a stern, hard braket to link the engine to the passenger side brace. xctasy wrote: From a 13 second 66 Mustang by MustangGeezer. 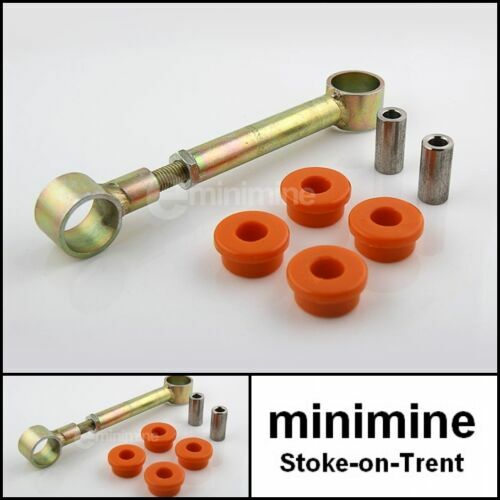 Some 3.8's before the balance shaft got introduced, have an additional drivers side 1.5" diameter shock absorber, it mounts to the power steering bracket, and then to the K member on yet another bracket. .
the only Capris and Mustangs with this are normally 83 and 84 3.8 convertables. ccurtin wrote: Anyone know what this bracket is? To the right of the engine mount, with the hole in it. Jason (rcoupe93) commented he had never seen one before so I started looking at other pictures to see if it stock or not. The car is an 84 Capri RS Turbo. How is it running? What plugs did you use? Was it too rich with the 500 Holley or perfect? Xctasy: Thanks for posting the pictures of the torque strap. Nothing new to report yet...been too busy with other stuff. I am running Autolite ap3924 plugs currently. Do I see an external voltage regulator? Was your DUI set up by WSA111? I had one direct from Performance Distributors, but I didn’t have much luck with it (module failure). You have an electric fuel pump with a regulator? Mechanical pump wouldn’t be able to keep up? Looks like, from a fitment point of view, you could easily mount a 4 BBL carb, is that right? Did I see a power brake booster? Do you have enough vacuum for that with the 278 solid lifter cam? I am running the factory voltage regulator. My DUI was not setup by WSA111 but I guess I lucked out because it runs great right out of the box. Did you have the module checked? I have had a few issues over the years where occasionally the engine won't start and there is no spark. I had the module checked the first time this happened and it was fine...but when I re-installed the module with a good amount of dilectric grease under it the engine fired right up! Since that first time I think this has happened once or twice and each time I would just remove the module, clean off any old dilectric grease and re-apply the dilectric grease and it would fire up every time. Hasn't happened in over a year or so. Yes, I do have an electric fuel pump and regulator. I was only getting about 3 to 4 lbs of fuel pressure with the stock fuel pump and since I used to drag race a lot I was advised to switch to electric for better performance. It's kind of overkill for the street though. I'm not sure if I could get a 4 bbl carb on there or not. I have no hood clearance as it stands and I don't even have the base installed to that tiny air cleaner because I couldn't close the hood with it. The air filter itself is actually resting directly on the carb flange. But as long as a 4bbl carb doesn't sit any higher than my 2bbl I probably could squeeze it in there! I do not have a power brake booster. But I do have 15 inches of vacuum idling in park with that 278 cam. Gene Fiore wrote: Nothing new to report yet...been too busy with other stuff. I am running Autolite ap3924 plugs currently. Car runs greats under light to medium acceleration both from a standing start and while cruising...very responsive and nice power. I put about 200 miles on it and when I checked the plugs they all looked like the day I installed them...white porcelain...no coloring. So I figured it's running a bit lean...no biggy. The real problem is at WOT acceleration...it falls flat on it's face and stalls! Here is what I have done so far with some success but still need help. All of the following tests are from a standing start. First thing I did was change main jets to 75 since I feel it is a bit lean...I also installed a new 65 powervalve just in case the old one was bad. WOT still bad but really didn't think that would have any affect. Next was to tackle the pvcr. Thinking it might be lean I installed .057 restrictor but was at least as bad as before...maybe worse. So I drastically went the other direction and installed .049 restrictor...better under 3/4 throttle acceleration...now it lays rubber and feels stronger but not great...WOT start the same...bad. Next I tried leaner yet on the pvcr to .047. No noticeable difference really...WOT start still stalls. Next I changed the acc pump squirter to .028. Seemed a bit better under 3/4 throttle start but WOT start the same. I decided then to go on a bit of a drive out of the neighborhood. Again...part throttle acceleration and cruising acceleration feels real strong...maybe even better than before any changes. I wanted to test how it feels to accelerate from about 10 to 15 mph while in 1st gear under WOT. Previous tests of this kind resulted in huge bog but once rpm gets past about 3500 feels like gang busters. This test was better...not the huge bog like previously but kind of lazy until the rpms get to around 3500 or so...then great. I'm baffled by all of this. Is the engine seeing a completely different signal from the carb between the log head setup and the alum head setup? Could the 50cc acc pump be too much all of a sudden...and why? small intake runners can cope with a lot of cam duration. Big runners don't like a lot of cam, but you can compensate with ignition advance, and going up to a 4-bbl carb. pmuller9 wrote: What is the initial ignition timing with the vacuum advance disconnected and a very low idle rpm? The reason for asking is: the 280/280 cam requires a lot of initial timing. If the initial timing is not enough then the load put on the alternator by the fans will load the engine enough to stall it when you come to a stop. Bob the builder ( 62Ranchero200)and 69stang_250 all had the same problems with the 250. My very similar 250 with aluminum head and “500 CFM” Holley 2V ran best with 12 degrees initial timing. To compensate for the high initial timing, the mechanical advance was limited (to 12 degrees max if I remember correctly). I used a high quality wide band A/F meter (mine was Autometer) to tune my setup. Vastly more information, real time compared to reading plugs. Are you using a wide band? If not, how can you know if your stall at WOT is lean or rich? As I remember, you develop quite a bit more vacuum than I do (15” at idle vs. my 11” at idle). Maybe your PV isn’t opening as quickly as is needed? Finally, torque converters rated for V-8s often stall at lower RPMs with our sixes. Your 2800 stall speed converter may stall at 2200-2400 RPM with your engine. The real solution is a T-5. I don't have a wide band...so tuning is very difficult. I'd really like to be able to make the 2BBL carb work.